"We have lost our way on our path. and where we come from." and is reprinted here for all my Blog Followers to enjoy. Spirits abound at the Heirloom Art Studio, on Wears Valley Road, but they aren’t your ordinary Christmas Spirits and, most definitely, are not the frightening kind of apparitions you find fading in and out of late night horror movies. 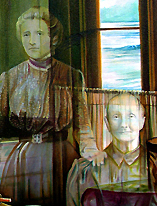 The transparent Spirits Kathryn Rutherford paints at the Studio are the ancestors of families she expertly depicts to tell extraordinary stories of ordinary lives. Heirloom Art Studio, established in Canada, in 1980, was relocated to Wears Valley in 1999. In the building at the top of the driveway, directly across the street from Valley View Road, the Studio houses the five company operations of Kathryn and Greg Rutherford and their daughter, Tania, the newest partner. Everything from specialty and New Age gifts to graphic and web design, custom screen printing, personalized merchandise, fine art and photographic restoration ships from this unassuming building. In 2004, Kathryn Rutherford, an award-winning, internationally known fine artist, instructor and restoration artisan with a thirty-five year career, sent her fine art talents and techniques in new directions when she painted a series of original oil paintings commemorating the historic Headrick Chapel and Cemetery located at the western end of the Valley. As part of a fund-raising activity to restore the Chapel, these works were painted to include ancestors of Valley families associated with the property. While many persons are seen standing throughout the exterior grounds of one painting, it is the interior painting which is most intriguing and sets Kathryn’s artwork apart from most portrait artists. 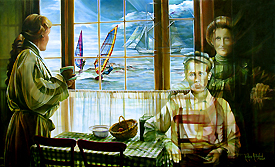 “The Guardians of Headrick Chapel” depicts the see-through visions of Chapel families and former attendees and this particular painting has been awarded several distinguished awards. 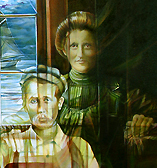 Spirit Paintings caught the attention of the public and clients began ordering them custom commissioned to depict their own family ancestors and family stories. An example of just such a case are two large works Kathryn painted originally just for herself. Positioned in the kitchen of an historic farmhouse museum in Canada, where she grew up on Lake Erie, the painting portrays the artist drinking tea out of her Great-Grandmother’s tea cup and gazing out of the window at the activity taking place on the lake. Appearing out of the shadows are Rutherford’s Great-Grandparents. As one of the last Tall Ship Captains on the Great Lakes, one of Captain Frank Ives’ ships appears in the clouds on the horizon. 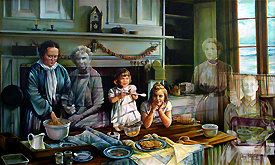 The companion painting in this series shows a broader view of the kitchen where Kathryn’s cousin, Kristen Ives, appears in costumed dress. As Assistant Curator of the museum, her role is to instruct school groups and the general public in the way of life on an 1800’s working farm. Assisting with kitchen preparations, over her shoulder, is Kristen’s own Great-Grandmother, Georgina Siddall Ives. The children in this painting are the artist, herself, at age three and eight and the remaining elders are the artist’s Great-Grandmother (sister in-law to Georgina) and Great Great-Grandmother. Three generations of family branches depicted in one work of storytelling art. Both of these paintings were recently juried into the 15th Sevier County Biennial Juried Art Exhibition which will open on January 7th, 2011 at the Arrowmont School of Arts and Crafts, in Gatlinburg. The Opening Reception and Awards Ceremony, which is open to the public, takes place 6:00-8:00pm on January 7th and the exhibition remains on display until February 26, 2011. 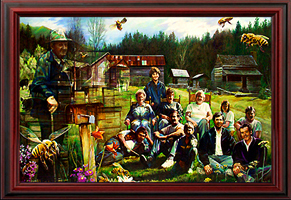 Also of importance to local history, are Rutherford’s most recent paintings which record the last resident of Cades Cove, Kermit Caughran, his wife and many of their children and grandchildren. These paintings, depicting the well known bee keeper, strike a note with local residents and tourists alike because many remember the kindly gentleman of the Cove, who passed away in 1997, and the bee boxes that lined his front yard close to the exit of the Cove. 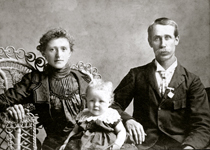 In the “Spirit of the Season”, now is the time to think about family, ancestors and the stories that would make unique fine art. Stop by the Heirloom Art Studio to discover it’s offerings on the hill and discuss a one of a kind Spirit Painting of your family. Kathryn can’t wait to begin work on her next masterpiece.